Turn a new page because it's back-to-school at Ever After High! 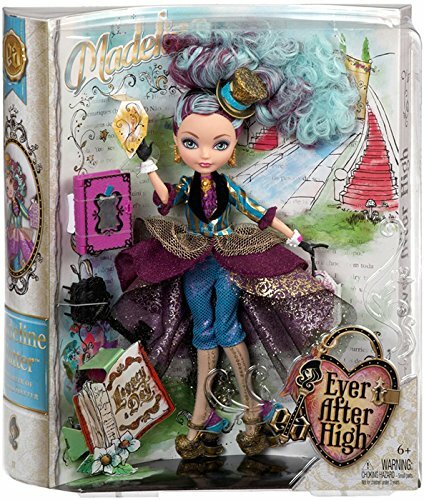 Madeline Hatter doll, daughter the Mad Hatter, is ready for her studies and fableous fun dressed in spelltacular outfit featuring deluxe details that reflect her personality and fairytale legacy. To complete the look, accessories include a personalized crown/headband, book-style purse, brush, shoes and "laptop." Colors and decorations may vary. 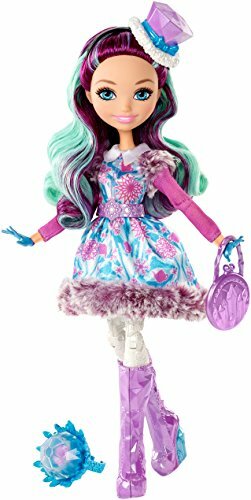 Ever After High experiences a magical snow day in the all new Netflix Original Series “Epic Winter,” but is it to be forever after? Madeline Hatter, daughter of the Mad Hatter from Wonderland, is dressed for the adventure in wintry looks with snowy sparkle and fur detailing. Cool accessories include detailed snow boots, an iconic headpiece and themed bag. A child-sized ring lets kids accessorize too! Plus a storybook add to the fun. Madeline Hatter, daughter of the Mad Hatter, is hexcited to spellebrate Legacy Day, the epic event where students are supposed to pledge to follow in their parents' fabled footsteps. The Ever After Rebel is set to make a tea-riffic statement in a fashion to go mad over - an hexquisite jacket with colorful layers and enchanting accessories. For a tea-party touch, a golden tea-hat headband adorns her curly, color-streaked ponytail hairstyle. 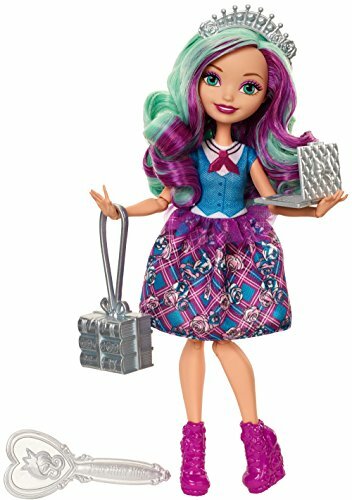 To hextend the fun, she comes with a doll hairbrush and a book that can store spellbinding accessories! 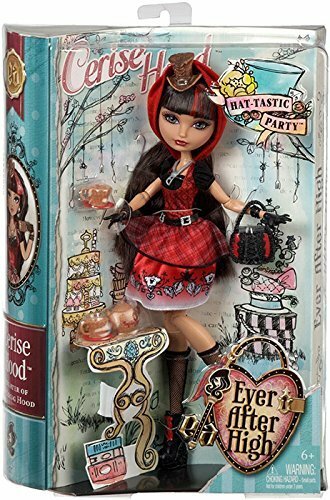 Cerise Hood is starting a new chapter with Ever After High, where the teenage sons and daughters of famous fairytales decide whether or not to follow in their parents' fabled footsteps. 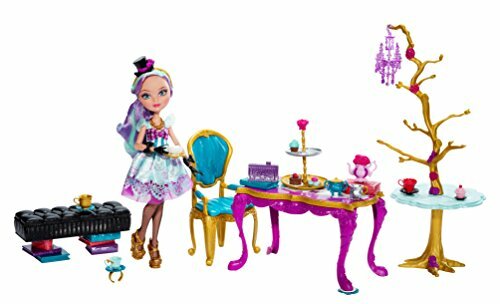 Madeline Hatter, daughter of the Mad Hatter, is throwing a Hat-tastic Party with all her friends to help save the Wonderland Grove from losing its wonder and magic. 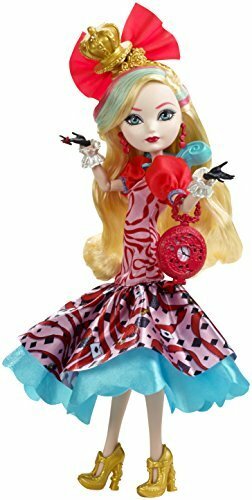 Cerise Hood, daughter of Red Riding Hood and a member of the Ever After Rebels, is dressed tea-rifficly for the occasion in a modern tea-inspired dress. Unique heels, a wicked awesome handbag and a fableous matching hat are spellbinding touches. While wearing hexquisite black gloves, she can sip tea in epic style from her picnic basket-inspired teacups and personalized teapot. A red streak in her hairstyle adds an extra-modern edge to her fairytale-inspired look. The posable doll's details make for hexquisite display. Doll comes with purse, hairbrush, teapot, teacups and doll stand. Collect her friends forever after to expand the guest list.